Fulfill all your requirements for a lab-based chemistry course while exercising your student’s practical-problem-solving skills and scientific reasoning. This one-year chemistry course is done three days a week, one of which is a lab day. It is the equivalent of an honors chemistry for college-bound students. The text, being concept-oriented, is concise colorful and pictorial. Daily exercises reinforce the concepts while challenging the students to derive solutions to real chemistry problems. Because we send you all the necessary chemicals in their proper quantities, you can actually do the kind of intriguing labs that would otherwise be reserved for more formal lab settings. The labs solidify and enrich the text content in fascinating ways. 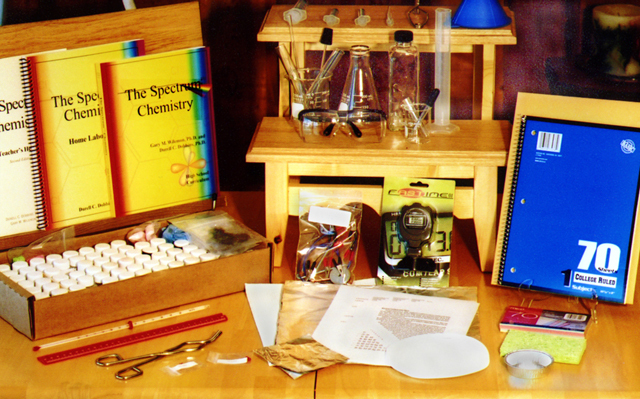 Your students will perform lab after lab that will captivate them with the principles of chemical reactivity. Your student will carry out reactions that glow in the dark, generate electricity, give off heat, instantly form a solid from two liquids, and the list goes on. There are 32 labs in the year. 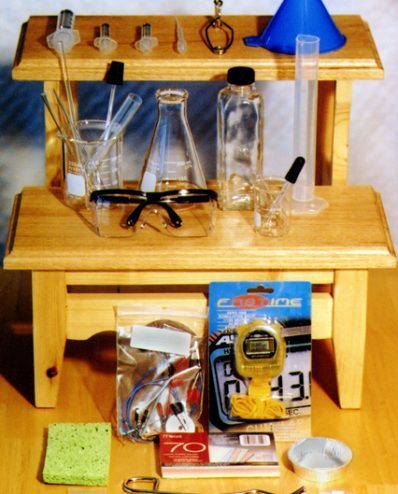 The labs come complete with everything you need to do them, except a gallon of distilled water. Ten quizzes are distributed throughout the course. They are provided in a separate quiz packet along with other items that are needed to complete the quizzes, such as graph paper and a periodic table. A study guide is provided to assure that your student knows before each quiz for what he/she will be held accountable. From start to finish, your student can complete the course with the confidence that help is available. 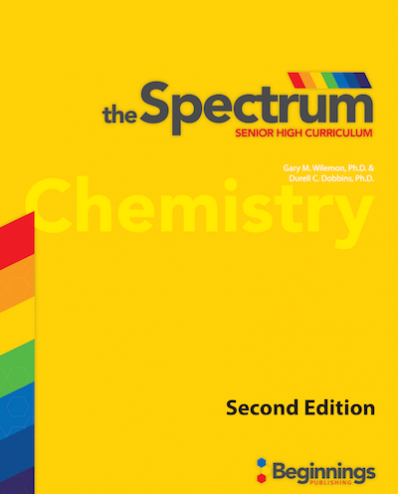 The Spectrum Chemistry is student-directed-parent participation is optional. 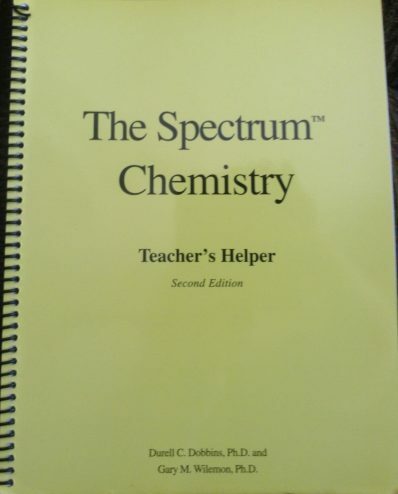 The “Teacher’s Helper” is a complete, step-wise, logical guide through the solution to every problem presented to the student, both in the textbook and in the laboratory. Parents or students can email us for support at any time. 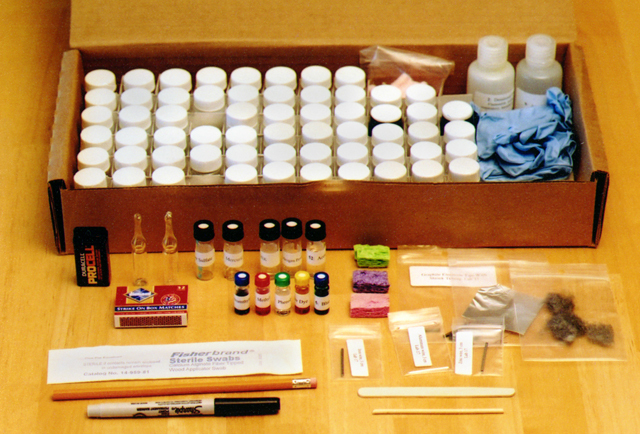 There are several problems inherent in chemistry: finding/purchasing the correct chemicals, purchasing them in the necessary quantity, measuring out the quantities required with the correct precision, safety in the handling of harsh chemicals and disposal of residuals. 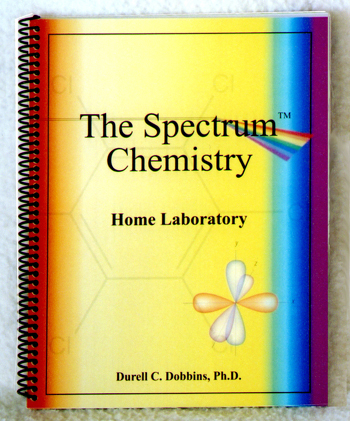 A homeschool father and chemist wrote these labs with safety in mind, so you can be assured that the labs are safe for use by the target audience. We have pre-measured the correct amounts of chemicals for the required number repetitions/replicates of each experiment, so no special equipment is required on your part. The author is also a specialist in waste disposal issues, so you can be confident that the residuals will be handled properly.